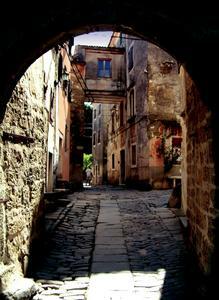 Istria is full of picturesque villages. John Kerswill spent a fortnight enjoying Istria, a part of Croatia that's recovering from a turbulent past. Now it's an idyllic rural retreat. Hmmm, Istria, Istria... isn't that somewhere between Ruritania and Illyria? Indeed it is. Ruritania may not exist, and the east side of the Adriatic hasn't been called Illyria for a millennium, but sitting by the pool outside an Istrian palazzo, surrounded by picturesque ruins, it was as though we'd been transported back in time or to some figment of a novelist's imagination. But there's nothing mythical about Istria or the part it plays in Croatia's revival as the Mediterranean's latest hot spot. Handily placed at the top of the Adriatic, opposite Venice, the peninsula offers a tempting alternative to more mainstream holiday destinations. It's not a new phenomenon. Delightful old seaside towns like Rovinj, Porec and Opatija have attracted holidaymakers since Edwardian times. And when Yugoslavia was in charge big coastal holiday developments were added in the '70s and '80s. But what never developed under communist rule – unsurprisingly – was any significant private villa-based tourism. Now Croatia is an independent country, foreign homeowners are newly welcome. What makes the holiday home boom in Istria different is that instead of relying on cramped new-builds, it has mostly centred on the restoration of old, abandoned properties in the interior. The abundance of picturesque ruins is down to Istria's tangled history. After 1945, the exodus of Italians from hill villages in the Istrian interior left them almost deserted. Small farms were abandoned and the terraces, which for centuries had been painstakingly cultivated to produce vines and olives, returned to scrub. With nobody moving in to farm, and no property sales to foreigners allowed, villages gently decayed.